Guess what was waiting for me when I finally got home last night? Oh yeah. The yarn for the other four Lillehammers. Which is fortunate, because I just finished the second sleeve on Captain Adventure's sweater and was all, Hmm, now what? I'm as adventurous as the next knitter, but there is no way I'm going to attempt steeking on a moving train, y'all. 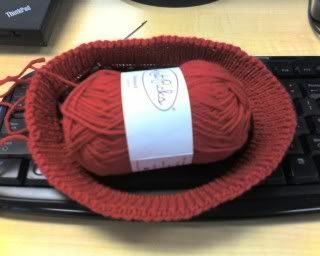 So I happily cast on the smallest of the red ones, and then halfway to the office realized that was probably not the best idea I've ever had. I mean, which would be worse, to run out of one of the main colors while I'm working on the biggest sweater, or one of the smaller ones? Plus, I'm sure I'll be heartily sick of these by the time I get to the fourth, which kind of nudges one toward doing the larger, slower ones first and saving the instant-by-comparison-gratification ones for later, does it not? So I'll do this one for Danger Mouse, then do mine, then Eldest and then Boo Bug, who will undoubtedly decide this means I do not love her at all and always do everybody else's stuff first and never do anything for her. Because she is (overly) dramatic that way. In other news, OHMYGAH. I went to this bakery called Specialties this afternoon for a little pick-me-up? And they had these "pecan tea cake" thingees and I said, Hmm, I like pecans. I want the recipe. Well. Not really. If I started making these things, I'd need a new wardrobe within a matter of days. But at the same time, I do. For special occasions. Because Tuesdays have long been underappreciated, and could use a little building up. Happy Tuesday! Have a tea cake! In celebration of the Tuesdayness! And then we could start having parades. The Tuesday Parade. With tea cakes. …say, I'm liking this idea more and more...viva la Tuesday! Um. Exactly how many of those do you think you'd get to eat after the herd of ravenous children went through? Oooohhh, Specialty's. The place I used to work was near one of their locations and every once in a while (every 2 - 3 weeks...) that is where we would order our company-provided Monday lunch. So. Good. Also their online ordering interface is the best I have ever seen. Maybe because I am high maintenance what with the "leave off the sprouts and the onions and the avocadoes and change the bread to..." and they make that stuff obvious and straightforward to do. We'd get cookies too. And then pretend we were being virtuous and only eating half a cookie. But everyone snuck back into the kitchen a couple hours later to eat another half.